The first parliament in Ottoman history featured 130 members, including 80 Muslim and 50 non-Muslim deputies. Winning an election is the best way for the head of state to claim power in Islamic culture. Abu Bakr, the first caliph of Islam, came to prominence with elections. That said, the selection is often made based on the religious qualifications of the candidates. If a Muslim sets out on a journey to transform the world, he will surely do so looking for political clout. The first modern elections in the Ottoman Empire took place in 1840. During this period, local parliaments were established in rural regions to take care of issues related to administration and public order. These parliaments were convened under the presidency of either the governor or the head of a district according to the region. Local parliaments also featured members from the local population. Half of these members were chosen from Muslim residence while the other half were chosen from non-Muslim communities. Moreover, the members of the temporal council that were in charge of earthly affairs of the non-Muslim communities, such as the managements of schools and orphanages, were also chosen through elections. Some historians contend that the status of minorities in the Ottoman Empire had no match in Europe at that time. In 1876, a modern constitution entered into force and a constitutional monarchy was established in the Ottoman Empire and a parliament of elected deputies convened in Istanbul. However, Sultan Abdülhamid II abolished the parliament and suspended the upcoming elections because he linked the establishment of parliament to his empire's defeat in the 1877 Ottoman-Russian War. The sultan ruled the country from the palace for 30 years. In 1908, elections took place once again and a parliament convened as a result of the rebellion of low-rank military officers in the Balkans. The Committee of Union and Progress (CUP) took control of the country's rule. 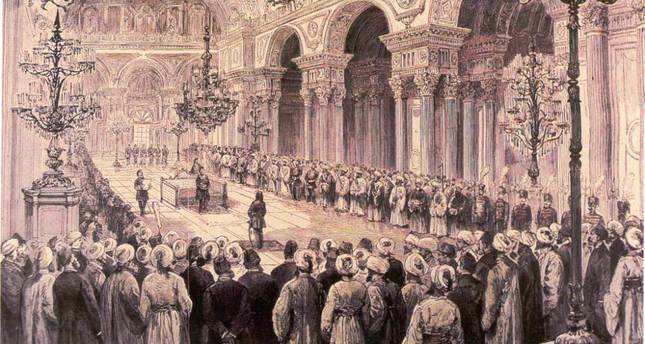 The first parliament in Ottoman history featured 130 members, including 80 Muslim and 50 non-Muslim deputies. However, in the 1908 parliament non-Muslim communities only had 50 representatives despite the total of 280 deputies in parliament. Ottoman male citizens who paid taxes or had property in the empire could vote in elections. One deputy represented 50,000 people. The elections were held in two stages. In the first stage, every 500 voters elected one secondary elector. In the second stage, the secondary electors elected the members of parliament. This kind of two-staged election is similar to the presidential elections exercised by the U.S. until 1946. Back then, elections held in Europe were more or less the same. Those who did not own any property or pay taxes could not vote in Europe. Women had no right to vote; only the wealthy and royals had voting rights. Modern political parties in the Ottoman Empire started to be established after 1908. The CUP, which began to lose the sympathy of the public before the 1912 elections, suppressed voters in order not to lose. Voters who wanted to vote for opponent candidates were beaten by devoted CUP partisans. Hence, following the 1912 elections, infamously known as the "elections with sticks," the country fell into the clutches of a single-party dictatorship. When the CUP was overthrown in 1918, elections took place once again. What remained of the Ottoman Empire was ruled by a multi-party democracy, which even included a socialist political party. Free and liberal thinking expanded thanks to a free press. The nationalist movement, which sprouted in Ankara, did not allow anybody to take part in the 1919 elections except for their followers. However, the last General Assembly of the Ottoman Empire transferred to Ankara on April 23, 1920 as Istanbul was under enemy occupation. Upon realizing he could not fulfill the grand visions for Turkey with a relatively democratic parliament, Mustafa Kemal Atatürk abolished the parliament in 1923. He gathered a new parliament with deputy candidates he chose and became president. Proclamation of the republic and revolutions were made happen by this parliament The new deputies were members of the Republican People's Party (CHP), which was led by Atatürk himself. There were elections. However, there were no opposition parties. Everybody had to vote for the candidates chosen by the government. The elections were the public confirmation of the deputies chosen by the president, similar to the political atmosphere in the Soviet Union. 18 women chosen by the government were sent to Parliament after the 1936 snap elections. 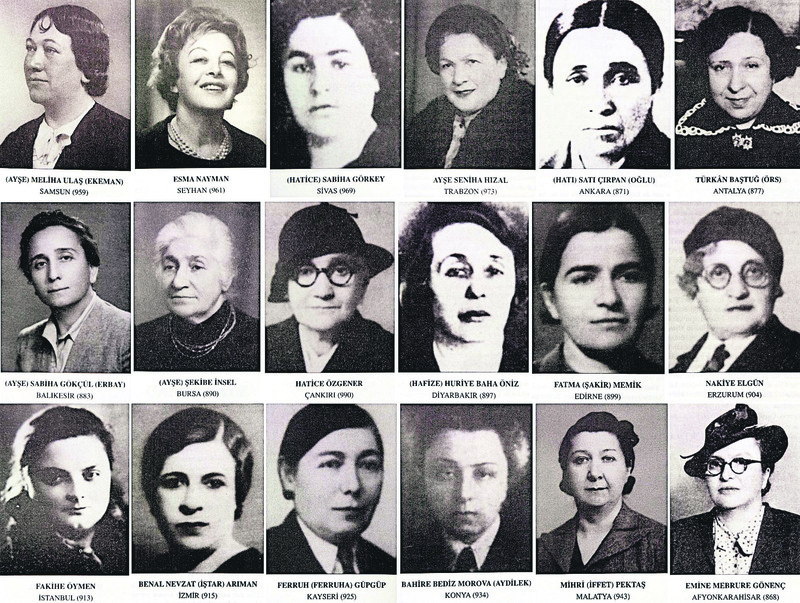 Women's suffrage was announced in Turkey in 1935, and 17 women chosen by the government were sent to Parliament. But does it matter in a country where all men did not have the right to vote or stand for election freely? To appease the opposition, the government presented an extra candidate in every province in 1943 and supposedly presented second electors with more flexibility and choice. Although Turkey did not participate in World War II, poverty devastated the country. Then President İsmet İnönü of the CHP agreed to hold democratic elections, despite the fact that he was not a democrat, in order to receive aid from the U.S.. The Democrat Party (DP) was founded by opponents of the CHP in 1945. The 1946 elections were similar to the 1912 elections. These elections were "open vote, hidden dissection." The governor, head of the district, mayor and the provincial head of the CHP were essentially the same person. They tried to force people to vote for the CHP with the help of the gendarmerie. Many fights broke out around ballot boxes. But no incident used to occur until those elections, as the winners were pre-determined, the votes were not even counted and sent to paper mills. The 1946 elections were a turning point for democracy in Turkey. These elections were also the first single-staged elections in which people elected deputies directly. Until then, there was majority rule. Similar to the system in the U.K., the political party that received the majority of the vote claimed all the seats in parliament. The scheme that the CHP pulled in the electoral law in order to prevent the DP from wining ultimately benefited their successors. After the 1950 elections, the CHP has never come to power with a majority. Although elections were suspended many times with the cooperation of the military and bureaucracy, elections turned into an essential practice for Turkish citizens. The 1961 elections took place on the basis of proportional representation. According to proportional representation, each political party was represented in Parliament according to the number of votes they received in the elections. However, a coalition was inescapable in this system. After the 1980 coup, an election threshold was established to prevent coalitions and marginal political parties from entering Parliament. Political parties that did not receive more than 10 percent of the vote were not represented in Parliament. To prevent carousel voting in the 1979 elections, the practice of applying black ink that stayed on voters' fingers for days began. The public called the elections the "inked elections." This practiced was abandoned in recent years. The elections reminiscent of carnivals or battle scenes, until recently, have not been as lively as they used to be.